Two rectangles are similar. One rectangle has dimensions centimeters and 100 centimeters; the other has dimensions 400 centimeters and centimeters. What value of makes this a true statement? For polygons to be similar, side lengths must be in proportion. and 100 in the first rectangle correspond to and 400 in the second, respectively. This is impossible since must be a positive side length. and 100 in the first rectangle correspond to 400 and in the second, respectively. 200 cm is the only possible solution. Which of the following is not a necessary condition for rectangles A and B to be similar? All sides being equal is a condition for congruency, not similarity. Similarity focuses on the ratio between rectangles and not on the equivalency of all sides. As for the statement regarding the equal angles, all rectangles regardless of similarity or congruency have four 90 degree angles. What value of makes the two rectangles similar? For two rectangles to be similar, their sides have to be proportional (form equal ratios). The ratio of the two longer sides should equal the ratio of the two shorter sides. However, the left ratio in our proportion reduces. We can then solve by cross multiplying. We then solve by dividing. The following images are not to scale. In order to make these two rectangles similar, what must the width of rectangle on the right be? For two rectangles to be similar, their sides must be in the same ratio. This problem can be solved using ratios and cross multiplication. Let's denote the unknown width of the right rectangle as x. Two rectangles are similar. One has an area of and the other an area of . If the first has a base length of , what is the height of the second rectangle? The goal is to solve for the height of the second rectangle. Similar rectangles function on proportionality - that is, the ratios of the sides between two rectangles will be the same. In order to determine the height, we will be using this concept of ratios through solving for variables from the area. First, it's helpful to achieve full dimensions for the first rectangle. It is given that its base length is 5, and it has an area of 20. This means the first rectangle has the dimensions 5x4. Now, we may utilize the concept of ratios for similarity. The side lengths of the first rectangle is 5x4, so the second recatangle must have sides that are proportional to the first's. We have the information for the first rectangle, so the data may be substituted in. 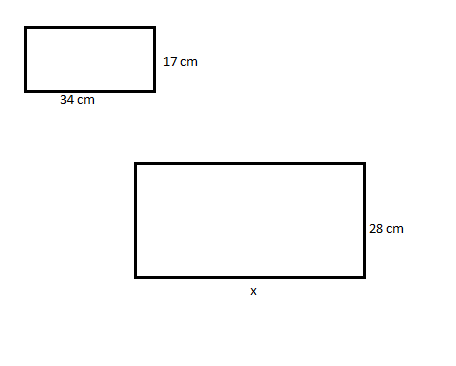 is the ratio factor that will be used to solve for the height of the second rectangle. This may be substituted into the area formula for the second rectangle. Therefore, the height of the second rectangle is 10. There are two rectangles. One has a perimeter of and the second one has a perimeter of . The first rectangle has a height of . If the two rectangles are similiar, what is the base of the second rectangle? The goal of this problem is to figure out what base length of the second rectangle will make it similar to the first rectangle. Similar rectangles function on proportionality - that is, the ratios of the sides between two rectangles will be the same. In order to determine the base, we will be using this concept of ratios through solving for variables from the perimeter. First, all the dimensions of the first rectangle must be calculated. This means the dimensions of the first rectangle are 10x5. We will use this information for the ratios to calculate dimensions that would yield the second rectangle similar because of proprotions. is the ratio factor we will use to solve for the base of the second rectangle. This will require revisiting the perimeter equation for the second rectangle. The attached image represents the dimensions of two different brands of manufactured linoleum tile. If the two tiles are similar, what would be the length of the large tile, given the information in the figure below? since that's true, the rectangles are similar. To find the scale factor, either divide 25 by 10 or 7.5 by 3. Either way you will get 2.5. Boston University, Bachelor in Arts, Biochemistry and Molecular Biology.